Caitlin McDonough MacKenzie. Photo by S. Truesdell. Kate Ruskin. Photo by M. Correll. Stephanie Spera. Photo by C. Allen. 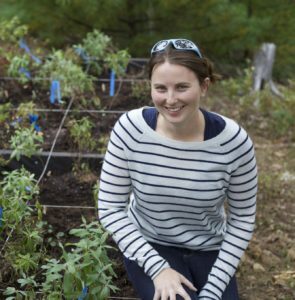 McDonough MacKenzie is building on her current research into the ecological history of sub-alpine plant communities in Acadia, using paleobiology to examine records of pollen in the sediment of the Featherbed, a remote pond on the western slope of Cadillac Mountain. McDonough MacKenzie hopes to complement these records with insight from discussions with Wabanaki community members to provide a fuller picture of Acadia’s past landscapes. 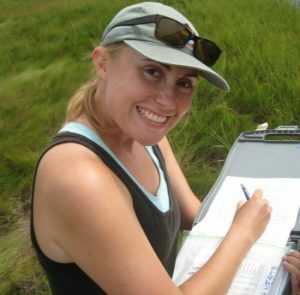 “Research on the paleoenvironmental record of subalpine vegetation in Acadia is deeply relevant to our understanding of climate change, and Acadia National Park offers a unique landscape for assessing and communicating about long-term ecological changes,” said Rebecca Cole-Will, Chief of Resource Management at Acadia National Park. 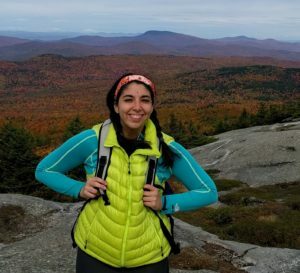 McDonough MacKenzie will be presenting her research on Acadia’s changing seasons at the College of the Atlantic as part of the Human Ecology Forum on April 24, which is also during National Park Week. Ruskin plans an evaluation of human values of Acadia’s freshwater resources, in order to help Park staff manage diverse uses of lakes and streams. “This project should enhance our ability to manage park water resources by providing better understanding of the perspectives of all stakeholders and fostering communication and collaboration,” said Acadia National Park biologist Bill Gawley. Schoodic Institute at Acadia National Park is a close nonprofit partner to the National Park Service, pursuing collaborative solutions to critical environmental challenges through discovery and learning. The Institute helps the National Park Service achieve the original vision for Acadia as a destination for science and inspiration, and seeks to be a national leader for research that inspires environmental stewardship. More than 20,000 National Park Service employees care for America’s 417 national parks and work with communities across the nation to help preserve local history and create close-to-home recreational opportunities. Visit us at www.nps.gov, on Facebook www.facebook.com/nationalparkservice, Twitter www.twitter.com/natlparkservice, and YouTube www.youtube.com/nationalparkservice. This project is made possible in part by a grant from the National Park Foundation through a generous donation from the David Evans Shaw Family Foundation. A film launching Second Century Stewardship can be viewed at https://vimeo.com/166811651.